Over 3000 years ago, Jewish scribes tell us on the 9th day of the 5th month, the false report of 10 of the 12 scouts Moses sent to the Promised Land, as described in the book of Numbers in the Jewish and Christian bibles, brought such bad reports to the people that it caused them to say, "We would rather die in this desert than live in the Promised Land!" Because of this, Israel's taking of the God-given land was put off for an entire generation, and they instead wandered in the desert. What was a Promised-Land-bound 11 day journey from Egypt to Canaan turned into a 40 year wandering through the desert. 2593 years ago, in 586 BCE, on the 9th day of the 5th month, God's house in Jerusalem, which had stood for over 400 years and was built by King Solomon, was destroyed by the Babylonian Empire. The book of Jeremiah in the Jewish and Christian bibles was written during this time. 1938 years ago, in 70 CE, one the 9th day of the 5th month, about 30 years after Messiah's death, the 2nd Temple was destroyed by the Roman Emperor Titus. The Arch of Titus in Rome, which stands to this day, depicts Roman soldiers carrying off relics of the Temple, including the Menorah, trumpets, and the Table of Showbread. To this day, Jews refuse to walk under the Arch of Titus. A notable exception is when the State of Israel was recreated in 1948, when Roman Jews symbolically walked through the Arch in the opposition direction towards Israel. 1873 years ago, in 132 CE, on the 9th day of the 5th month, after 2 years of a successful Jewish revolt against the Roman Empire, the Roman Emperor Hadrian finally crushed the Jewish rebellion, enslaved many Jews, banned the Torah, prohibited use of the Hebrew calendar, executed Judaic scholars, burned scrolls on the Temple Mount, and installed statues of the Roman god Jupiter and another of himself in the former Temple sanctuary. He wiped the memory of Israel and Judah from the map by renaming Judea to Palestine, after the Philistines, ancient enemies of Israel. ~1680 years ago, the "Holy" Roman Emperor, and founder of the state-sanctioned Catholic Church in Rome, Constantine I, (same man who officially replaced Passover with Easter) instituted a law that stated Jews be allowed to mourn their defeat and humiliation once a year, on 9th day of the 5th month, at the Western Wall in Jerusalem. Since that time, the Western Wall, which stands to this day, has become known as the Wailing Wall, after the wailing and crying of Jews for centuries at the destruction of the Temple, homeland, state and pride. This is the wall that US Presidential candidates John McCain and Barack Obama recently visited and prayed at. 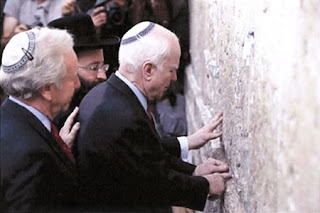 US Presidential candidate John McCain praying at the Western Wall. After Constantine's decree that Jews remember their defeat and humiliation once a year on Tisha B'Av, 9th day of the 5th month, the Western Wall became known as the Wailing Wall. 516 years ago, in 1492 CE, King Ferdinand of Spain decreed that all Jews in his kingdom, including Castile, Catalonia, Aragon, Galicia, Majorca, Minorca, the Basque provinces, the islands of Sardinia and Sicily, and the kingdom of Valencia were hereby expelled. King Ferdinand gave Jews 3 months to leave, and according to an Italian Jew, the last day for Jews to leave was the 8th day of the 5th month. If any Jew remained by the 9th day of the 5th month, his property and possessions could be confiscated and he would have to pay a hefty sum to the king. 67 years ago, on the 9th day of the 5th month, which fell on July 31, 1941 in the western calendar, Nazi politician and leader of the German SS during World War II, Heinrich Himler presented his Die Endlösung ("Final Solution") plan to Adolf Hitler and the Nazi Party, which called for the systematic destruction of the Jewish race. 66 years ago, on the 9th day of the 5th month, in July of 1942, Himler's Final Solution to the Jewish problem was formally implemented as the systematic deportation of Jews in the Warsaw Ghetto began. The Final Solution resulted in the last and most deadly section of the Holocaust, which saw the murder of 6 million Jews. "I am fasting and feeling sadness over the destruction of the Temple just like any Jew is feeling. But I am also mourning over the destruction of my house, my land, my community, and all of Gush Katif, which happened the day after Tisha B'Av." Tisha B'Av, the 9th of Av, falls in the 5th month of the ecclesiastical Hebrew calendar, the 11th month of the civic calendar. This year in the Western calendar, Tisha B'Av falls on August 9th-10th. That's today! Tisha B'Av is from sundown today until sundown tomorrow. Many observant Jews worldwide fast and humble themselves on this day. Derek Leman writes about the traditions of this solemn observance. I believe that right after the Land for Peace deal was put in force, Katrina hit the U.S. I know many would laugh at me for putting these two events together this way but I can't think of one without the other and it still gives me chills. I believe that the day on which the U.S. lifts its protection from Israel will more than likely precipitate the fall of the U.S.A. and Katrina was just a warning. Please get your facts straight: Constantine was not a pope! When the Edit of Milan was issued in 313 Miltiades was the pope. The office of the Bishop of Rome was recognized long before Constantine was even born. The Messianic world has enough misinformation going around as it is, discrediting it; you do not need to add to our already bad reputation. Yeah, that's true, Katrina did hit soon after Gush Katif's 8000 Jews were kicked out. I don't know whether this was God's doing. You're right, technically Constantine was not the pope. He did found the first state-sanctioned Christian religion at Rome and shaped its doctrine, which is why I called him the first pope. But you're right, he the founder of the state-sanctioned church, yet wasn't the pope, as there were bishops of Rome before him and during his time, so I've modified my post.